In which I discover that I like my serial killers to be not too close to home! 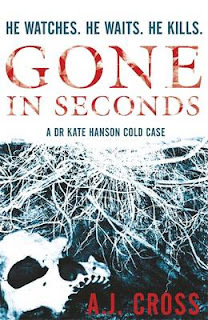 Gone in Seconds is the first in what will be a series of books featuring Dr Kate Hanson. It's a debut novel by a forensic psychologist, and it's about...a forensic psychologist. Well, that's fine. It lends an air of authority to the book. I mean she must know what she's talking about, right. So this is a thriller set in the West MIdlands and it's about a Cold Case Unit formed of the police and this forensic psychologist who works with them. I had no idea that was possible - she seems to be part of the police team, not just someone they consult from time to time. Anyway I guess the writer knows, for the reason stated above, plus I am prepared to accept this even if it's not likely for the sake of fiction. So, the plot is about the discovery of the remains of a young woman who disappeared five years before from a local shopping centre. The cold case team have to reopen the old case, for which no-one was ever arrested. This brings a lot of hostility from the previous investigaing officer who is now their superior. Dr Kate Hanson determines from the evidence that the killer might be a "repeater" and that there might be other unsolved cases, other undiscovered bodies. I felt the book was a good reflection of the West Midlands where it was set. In fact that turned out to be the only problem I had with this book. One of the victims disappeared from a nightclub in Wolverhampton and I thought to myself that my daughter goes to nightclubs there, so really I'd rather not read about a serial killer stalking young girls there. And one possible victim had disappeared from Walsall which is where I live and work. And that was all a little too close to home for me. Much as I like fictional serial killers and like to read about them in places that I recognise, and I loved watching Morse when I lived in Oxford so I could spot places I knew, it turns out that I prefer my serial killers not to operate in my neighbourhood. It seems I'm a serial killer NIMBY. Who knew? Gone in Seconds is available now in hardback and trade paperback. I was reading a proof copy, kindly supplied by Orion.